The workweek can seem practically endless—even before it begins. Most of us spend roughly 7-8 hours at our desks every day, without moving an inch. Instead of feeling chained to our desks, our “homes away from homes” should feel like a space in which we’re able to find moments to relax. Unfortunately, sometimes that’s just not the case. While we may have finally achieved somewhat of a work/life balance, there are moments where work simply feels too much. In other words: how do you handle those days where you have zero chill, and you don’t have a second to breathe during office hours? This office self-care tip happens before you even get to the office. In our piece about being well-rested, Maggie Winter, co-founder of the clothing brand AYR, said that “sleep is extremely important to me and my ONLY consistent investment in *buzzwords* self-care and wellness.” Your sleep has the ability to completely impact your day, so it should be respected as such! Not getting enough sleep can lead to serious burnout, and that’s definitely not something you want happening at work. Practicing great sleep hygiene, like staying away from caffeinated drinks, nicotine, and alcohol before bed; reserving the bed for actual sleep and not reading or watching TV; and maintaining a consistent bedtime/wake-up time (yes, even during the weekend), can give you better quality of sleep you’re searching for. If you’re well-rested when you wake up in the morning, think of all the time you’ll save when you’re not snoozing your alarm over and over. Being well-rested allows you to have a bit of me-time in the morning, whether it’s a nice long shower, some time to read, or even jump-start on work and answer emails, you’ll get everything off to a great start to help you feel more at ease the minute you get to the office. Rachel Ritlop, millennial lifestyle expert, says that meditation is actually one of the easiest forms of self-care you can do in the office, especially if spending much time away from your desk isn’t a viable option. You don’t even have to move! “It can be as simple as taking just a few deep breaths and grounding back into your body,” says Ritlop. Career coach Jill MacFadyen also says, “You can meditate by being 100 percent involved in your work.” No matter what, when you’re stressed or just feeling out-of-whack, deep breaths can be the perfect quick fix to calm your racing mind that’s filled with tasks, to-dos, and deadlines. Another pro tip from Ritlop: “If meditation feels intimidating, there are also tons of apps out there today, like Headspace, that can guide you through it!” It’s probably best to do this in an area where people can’t bother you, like the park on your lunch break or an empty conference room. This one might sound a bit unrelated to your work life, but Ritlop says, “Hear me out. Social media tends to leave the majority of people feeling “less than.” And if you’re looking to practice self-care at your desk because of a crummy boss, you don’t need to see your college roommate on some glamorous transatlantic vacation.” She has a major point. 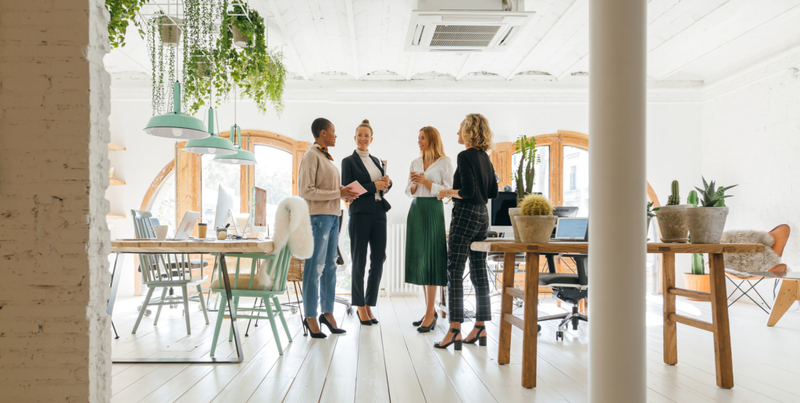 If your circumstances include a less-than-favorable employer or group of coworkers, you don’t want to dwell on what could be, even if it’s the perfectly curated (and often, less than accurate) version of that. Her advice is to, “use that time to either play a game you actually enjoy and that recharges you, read a few pages of a book that inspires you, or practice some of the other things in this article.” We’d have to agree on that last point. So when you’re not scrolling mindlessly during work hours (don’t worry, we won’t tell anyone), there are other things to occupy your mind when you don’t have Instagram at your fingertips anymore. Try listening to a podcast. There are so many genres to try, and it’ll definitely keep you entertained while also keeping you productive. Plus, you can easily keep listening outside if you want to go for a quick walk when you’re in need for some fresh air. The energy within busy offices can be a bit hectic and chaotic, to say the least. However, you have the power to control and transform your own personal energy and perspective through visualization. “Choosing a way of thinking about the situation can help you with your self-care,” says MacFadyen. She tells us to ask questions like, “Does this job support you or your family? Does it allow you to work with friends? What good does it provide? What in this job can you be grateful for?” Energize yourself by remembering your job’s true purpose and all of the wonderful things that it brings into your life. Even the toughest days won’t feel so bad after a quick and positive reminder of why you’re there. Okay, this one is just plain fun. Who said the spa can’t also be at your desk? Try a 5-minute mini-steam. Here’s how to do it: get some hot water in a cup and add a few drops of essential oil (we prefer organic oils). Now get a big file folder and hold it over your head above the steam of the water. Close your eyes, take a few deep breaths and voilá, instant relaxation. If you’re anything like us, you might want to try a face mask at your desk, too. Sure, you might get a couple of looks from passing coworkers, but they’re not the ones who are going to have a wonderfully moisturized face and glowing skin by 6 pm now are they? If a full-on spa treatment isn’t quite your style, we also recommend a bit of acupressure. Some great spots to relieve stress are the fleshy part between your thumb and pointer finger and the soft spot below your sternum. Stress balls also work great for this, too. Specifically a reflexology stress-relief ball for mini-massages on your hands, feet, neck—really just about anything that needs to be chilled out. Like I said earlier, most of us spend a lot of time sitting at our desks every day, it should be inviting, friendly, and comfortable. Think of it as an extension of your home (but keep that work/life balance in mind!). When you look around your space, what do you see? Is it cluttered and filled with meaningless wires, papers, or even garbage? Clear out your desk area and in turn, your mind will also be cleared. Take some time to add items that will make you feel happy or inspired. Maybe it’s a picture of your dog, your favorite book of short stories, a plant that’s easy to care for, or a relaxing candle. Energize your space with positivity and creativity for when you feel as though you just might not have any anymore! Aaaahhh…. so much better already.